The global trading market when it comes to stocks or forex trading has exploded in size in the past 4 to 5 years, especially with the advent of online trading platforms. Several online platforms have emerged, offering users the ease of use, a large degree of convenience as well as a myriad of options when it comes to trading instruments. Tech savvy traders, especially those belonging to the younger generation prefer online platforms, but with innumerable options to choose from, it becomes a tough choice to make. Most online trading platforms release several variants of their software, programmed to be compatible with almost all major operating systems for computers; Macintosh and Windows compatibility are the most common ones. However, for users of Ubuntu, a Linux distribution software is preferred by a growing number of online users for varied reasons, ranging from efficiency to security. With only a handful of the trading platforms offering that convenience, let’s look at the major reasons why online trading using Ubuntu is so difficult. Many of the problems related to running any trading platform on the Ubuntu platform are related to compatibility because of its open source nature and lack of online support. While operating systems such as Windows and Macintosh have enough resource and support from the online community, this is largely absent for Ubuntu. There are few trading platforms which also offer Ubuntu compatible variants, but these are largely plagued by recurring problems and bugs that need addressing. For example, The Metatrader 4 platform, one of the most used trading tools can only be installed with WINE. This brings us to IQ Option, an already established name in the trading platform sector, with a growing customer base across the globe. The team behind IQ option have thus come up with a version exclusively for Ubuntu users, apart from the majority Windows and OS users in their client base. Currently IQ Option has an online web version that is Ubuntu compatible. They also previously offered a downloadable application for Linux and Ubuntu users, but shortly discontinued it, citing corporate issues. Nonetheless, the web version is still operational and provides all the same tools that the downloadable version had. It works with Chrome, Opera, Firefox and Safari Browser. 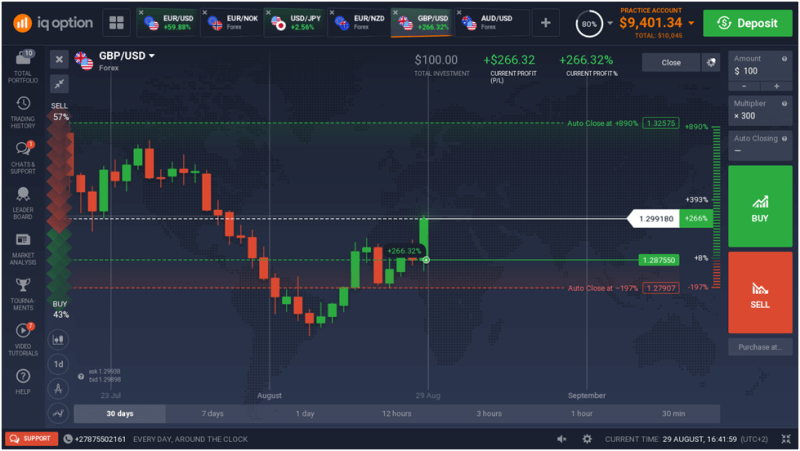 IQ Option allows Ubuntu users to efficiently use their platform to conduct timely trades, offering them all the trading options available with the standard version. These include Forex trading, stock trading, cryptocurrency trading, options trading, commodity trading as well as trading ETFs. Forex or foreign exchange trading has been one of the most sought after trading markets for years now, mainly because of the high level of liquidity the instruments offer. Compared to other markets such as stocks and ETFs, the spreads are comparatively low, with a daily turnover in trillions of dollars worldwide. IQ option offers 88 currency pairs for user’s trade in, with the EUR/USD, GBP/USD, GBP/CHF, GBP/JPY and USD/CHF markets being the most traded. They have also made some improvements in their forex trading offerings, allowing traders to trade the currency pairs with leverage up to 1:1000. Additionally, it also provides users with pre-set stop loss and take profit order functions. Stock trading with IQ Option provide users with an option of 174 stock CFDs, all tradable with leverage. This allow traders to create diverse portfolios with. The minimum amount for CFD trading per trade stands at $20. Ever since the international trading community took notice of the exceptional volatility offered by Bitcoin and other tokens, cryptocurrency trading is one of the most sought after trading options in the world. IQ Option offers users to trade in cryptocurrency CFDs, allowing them to speculate on the bullish and bearish, sometimes unpredictable movements of cryptocurrencies without owning any. Thus, the potential to make a profit is always high. IQ option offers both Standard Crypto CFD trading as well as Special crypto CFD trading. Standard crypto CFDs are offered to all clients. However, retail EU traders do not have access to trading with leverage. Special Crypto CFDs have a much higher leverage and comparatively lower spreads, which expire daily. However, retail traders from the EU cannot trade them because of certain international regulations. IQ Option has several variants of options trading for their users, with one of the most popular ones being Digital options trading. The potential pay-out in this case is the highest, up to 900%, and allows traders to choose between different strike prices. A total of 19 standard digital options (tradable during weekdays) and 8 over the counter digital options for weekend trading is offered by IQ Option. However, just as in the case of their crypto CFD trading, retail traders from the EU cannot access digital options trading. Binary options trading is regarded as the primary trading service for IQ Option, with the platform offering the services since early 2008. It has about 60 binary option instruments to choose from, containing options from forex pairs, stocks, stock indices, and even gold. FX options trading is provided by IQ Option as a viable alternative for retail traders from the European Union, who are banned by the European Securities and Markets Authority to trade binary and digital options. They offer 6 different FX option instruments available. IQ Option provides users the opportunity to trade in commodity CFDs, where they can speculate with different metals, crops, energy companies etc. without physically owning any stocks or commodities. It is similar to crypto CFD trading and stock CFD trading on the platform. It is open to non-EU, pro-EU traders (with a leverage of up to 1:150) and retail traders from the EU (with a limited leverage of 1:10). ETFs or Exchange-traded funds are the last category asset classes offered by IQ Option, opening traders to large market sectors or a group of assets by trading only a single ETF. They have low spreads and can be traded with leverage of up to 1:5 for retail EU traders and up to 1:100 for pro-EU and non-EU traders. As far as trading platforms are concerned, very few options are available that allow traders to seamlessly trade on a computer using the Ubuntu platform. The absence of a large number of applications workable with Ubuntu presents a major disadvantage to those small groups of traders. So, the most viable option after considering the limited number of options is IQ Option, which offers an impressive array of trading options in one single, comprehensive account. The Minimum deposit amount to open an account is just a measly $10. You can try IQ Option with a free Demo Account.